As one of America's foremost business philosopher’s, Jim Rohn has been hailed by many as a modern day Will Rogers. Jim is a gifted storyteller with dynamic delivery and thought-provoking substance. His wit and wisdom have made him a key influence on an entire generation and even personal development trainers such as Tony Robbins, Brian Tracy, Vic Conant, Les Brown and Tom Hopkins. 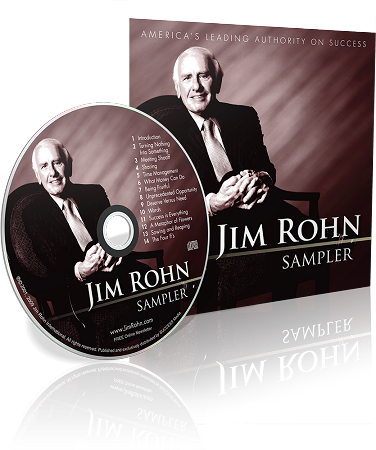 This 65-minute audio CD is a great introduction to Jim Rohn and makes a great gift to pass on to your friends, family and business associates. Also, be sure to check out the rest of Jim Rohn's products: The 1999 Jim Rohn Weekend Seminar Audio Program, Three Keys to Greatness DVD, The Challenge To Succeed AUDIO CDs, Cultivating an Unshakable Character Audio CDs, How to Have Your Best Year Ever DVD, The Five Major Pieces to the Life Puzzle Book, and Jim Rohn Treasury of Quotes Excerpts Booklet.